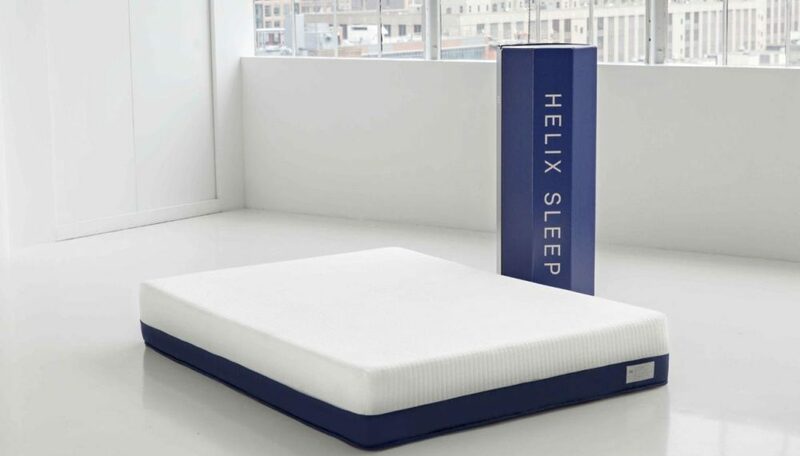 Helix Mattress Review: Is This Mattress The Right One For You? Bed-in-a-box companies, with their foam beds that arrive in a golf bag-sized box, are nothing new, but Helix has managed to create something unique: a custom bed-in-a-box for less than $1,000. Using its tech-based Sleep Quiz, the company encourages mattress buyers to take the quiz to determine their best match of firmness, temperature regulation, and so forth; there’s even a dual-sided option for couples. Too good to be true or genius? Keep reading to find out! Is A Bed-In-The-Box A Good Option For Me? How Do Returns and Warranties Work for Beds Purchased Online? What Makes Helix So Unique? Vacuum packed foam beds, delivered straight to the consumer, are so popular right now there’s a good chance you have friends or family who have purchased a bed this way. While it was Casper who paved the way back in 2014 for mattress innovation, a plethora of companies have popped up in its wake. There’s Avocado Green Mattress if you want an eco-friendly bed, and Purple if you want a bed-in-a-box that uses latex and plastic, not foam, but there aren’t a lot of custom options, which is what makes Helix mattresses so unique. Here’s how the buying process works: most companies offer their mattresses only online (Helix has a showroom in New York; companies like Casper now also have brick and mortar stores available throughout the country to better compete with the Mattress Firms of the industry). Since buying a mattress without first trying it out seems somewhat ludicrous, most bed-in-a-box mattress companies offer a trial period. Some are pathetically short (30 or 60 days) and some are extremely long (up to 365 days) but most--including Helix--are 100 days. The quality of the company determines how easy the return process is if you decide you don’t like your bed within your trial window; the return process can easily turn into a nightmare if the company chooses. Fortunately, the best companies develop a solid reputation for customer service and have specialized in making returns a breeze. And no, no company worth its salt ever resells a returned bed. 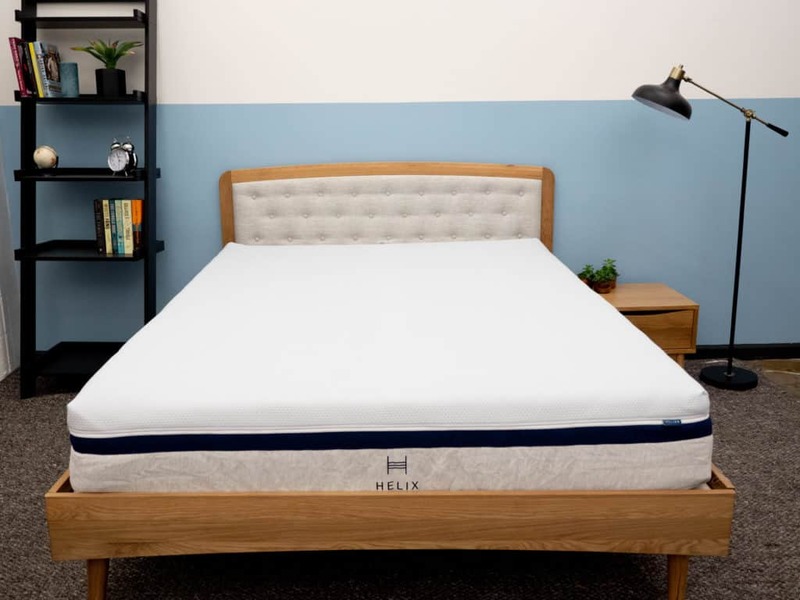 Just like traditional mattresses, online companies like Helix offer varying warranties (Helix offers a ten-year warranty, which is about standard in the industry and in line with how often people tend to replace their mattresses). Once you’ve placed your order, you’ll receive a box--usually from UPS and usually within the next or ten days (Helix utilizes UPS and delivers in 6-10 business days). Your mattress has been vacuum packed so that it is a third of its normal size and rolled like a jelly roll. You’ll unroll it, place it on your bed, and watch it “reinflate.” Within a few hours, it will be ready to sleep on! Most bed-in-a-box mattresses are foam; Helix, however, is a hybrid coil/foam mattress that utilizes both individually pocketed micro coils and high-density foam; we’ll talk more about that later! There’s usually a period of off-gassing, but on a good bed it should be fairly mild and clear out within a week or two. We’ll explain later how to ensure no weird chemicals have been used during your mattresses’ production. Here’s the bottom line for us: returning mattresses is no fun. Yes, it is possible to get it back in the box, but it’s difficult. It’s a hassle. Are there times when you might need to return a mattress you bought at a showroom? Absolutely. However, since you get to try it first, you’re less likely to need to make a return. In other words, you’ll have fewer surprises. You also need to be comfortable making larger purchases online. Most people are, but you might not be. You also might appreciate being able to try different beds from different brands in the same showroom. In either of these cases, purchasing a mattress at a local furniture store is a better option for you! One thing you’ll notice quickly, though, is how short the con section is--and how fat the pros section is below. Frankly, there are a lot of pros. The first and largest is the price. Thanks to their direct-to-consumer model, mattress companies such as Helix can skip the middleman (Mattress Firm, Sears, and so forth), and can pass the savings on to you, the consumer. You’re able to take advantage of better materials for less money, and nearly all companies include free shipping, so you’re not dealing with the hassle of delivery fees. Here’s another pro to consider: when was the last time you heard somebody say “I just love shopping for a mattress!” Laying down on mattresses while a furniture salesperson hangs out nearby is usually a bit awkward. It’s also worth noting that even a thirty-minute nap in a showroom won’t tell you what a full night’s sleep will be like. Inevitably, we tend to find things we’re familiar with the most comfortable. So, even if your doctor has recommended a firmer bed, it will take some time for your body to adjust. That’s why Helix, and many other mattress companies, recommends using your mattress for at least thirty days before you make a final decision--and you just can’t do trials like that with traditional mattress companies! Also, mega-brands like Serta and Sealy, while they’re known for being the mattresses we’ve relied on for years, have some shady tricks up their sleeves. They’re known for creating separate naming systems for their lines in different retail outlets so that you can directly compare price, allowing them to charge you more. Plus, if you compare the websites and sales pages of one of those big mattresses to, say, Helix, you see quickly how transparent these newer mattress companies are. It’s easy to exactly what’s in the mattress and what’s not. For educated consumers, this is a relief. We also appreciate how many reviews are available for the most reputable of the bed-in-the-box companies. Helix mattresses, for example, have over 6,000 online reviews, allowing consumers to feel like they know exactly what they’re getting. Customer testimonials, like everything else, can be skewed, but they are extremely helpful when it comes to noticing patterns such as bad service or poor edge support. Reviews are also the first place customers turn to when they can’t get help or answers from the company; we’ve seen companies that have a beautiful website, but awful reviews--those are the kinds of companies to stay away from! We’ve already mentioned that Helix mattresses are custom beds for less than $$. The company has created an algorithm that allows customers to communicate their sleeping preferences, how they sleep, and information about how much they weigh and how tall they are. Helix has built a profile that takes into account mattress feel, levels of support, what it calls “point elasticity,” and temperature regulation, which it will match to your answers to create a recommendation. 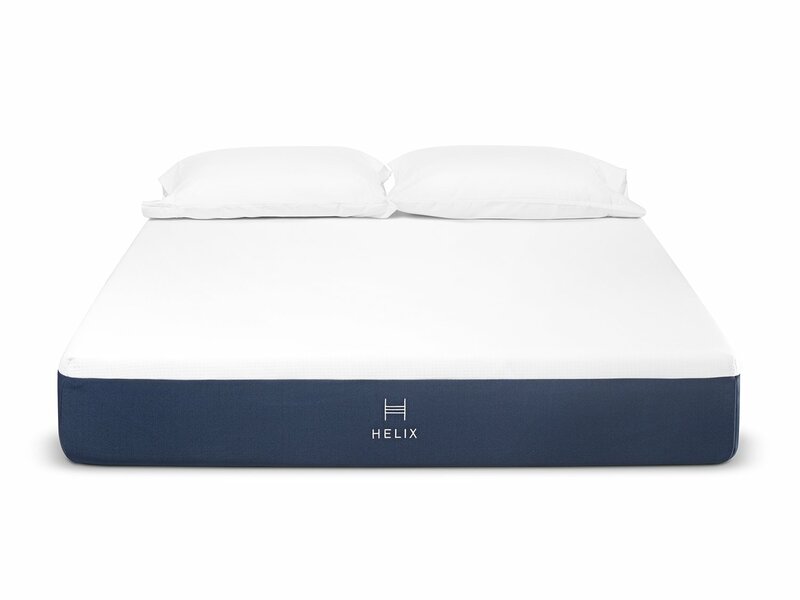 Helix mattresses are recommended for use with the company’s specially designed foundation, which is similar to a box spring and utilizes pine slates at five-inch intervals to allow for maximum support and air flow for its beds. These aren’t necessary, but Helix does say they’re helpful. The company also recommends using its special mattress cover, which will allow you to enjoy the feel of its mattress exterior while protecting the mattress. You can also purchase pillows and sheets. Do you have a partner, and do the two of you have trouble agreeing on the bed you want? That’s not a problem with a Helix mattress! There’s a questionnaire for couples, and Helix will either determine that you’re not as different as you think (in which case they will recommend a blended mattress for a happy medium) or that you should spend the extra $125 for a dual-sided mattress. It almost goes without saying, but we’ll say it: this kind of custom, built-just-for-you mattress should cost a lot more. We love that it doesn’t. Traditional mattresses are made from innersprings. High-tensile wire is curled up inside a comfortably padded exterior, allowing you to sleep on a pocket of air. Mattresses have been made from coil mattresses for decades now, which explains why we’re accustomed to that bouncy feel in our beds. Today, the best innerspring mattresses don’t use one big wire; they use individual coils and wrap each coil in its pocket. This limits motion transfer; i.e., if you move your feet while you’re sleeping on an individually pocketed coil mattress, your head won’t feel the motion--and neither will your partner. Coil mattresses are known for managing temperature well--in part because they have all that air inside. The downsides? Even with pocketed coils, motion transfer still happens. A foam mattress, however, is beloved by medical professionals for its benefits for people who have back and joint pain. Foam mattresses can change density but are designed to support while also conforming uniquely to your body in a way coils just can’t. Helix mattresses combine the best of both worlds by utilizing coils and memory foam. 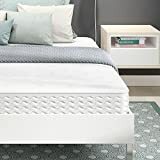 This allows you to enjoy the springy feel of the coil mattress you’re probably sleeping on now, maintain its great heat dispersion benefits, but also enjoy the comfort of foam. Is The Helix Right for Me? It’s very difficult to get anything approaching customization for less than $2,000--that Helix does it, and does it so consistently well, is a huge feat! Helix shares customer reviews on its website, but if you’re like us, you might be skeptical and wonder if companies somehow ditch the negative reviews. Fortunately, there are nearly 800 reviews online on third-party sites like Google and Yotpo; and these reviews are just as excellent. In fact, Helix has maintained a 4.6-star rating (out of 5 stars), which means that 8% of its reviews are three stars or less. This should make you hugely confident that you’ll get the product and quality you expect as well as the customer support to help you sort out problems should they arise. Customers are even writing in to say back pain is gone, they’re sleeping better at night, and they feel confident that they got a great deal. While most Helix purchases will be under $$$ or $$$, it’s helpful that Helix has partnered with a financing company to make the large purchase easier for buyers. Consumers are often concerned about the chemicals mattresses are made from, but Helix utilizes a third-party not-for-profit certification program called the Certi-PUR-US program. Thanks to the certification, you can know that Helix’s foam does not utilize heavy metals or toxic chemicals such as formaldehyde. Some reviewers report that the Helix mattress doesn’t have great edge support--something that’s common among foam mattress buyers. This isn’t much of a problem unless you tend to sleep right on the edge of the bed, or you sit on the edge of your bed frequently. You might need to purchase the Helix foundation, as well as the mattress cover. These are optional, but they will add to the price. Are there cheaper foam, innerspring, or hybrid options? Yes. Are there cheaper customizable options? No! If custom is the name of the game for you and you want something that’s also affordable, you can consider Helix mattresses a steal. « Casper Mattress Review: Is This Mattress Worth All The Hype?